Beverly Z. Saylor of Case Western Reserve University in Cleveland, a team member and an author of the report, said that at the time this hominin lived, the region had many lakes and streams with wooded shores, thus ample opportunities for arboreal habits. The dating of sediments where the bones were embedded was conducted by the Berkeley Geochronology Center in California. 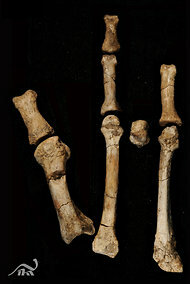 Another author, Bruce M. Latimer of Case Western Reserve, said the findings clearly showed that the adaptation to bipedality, though considered one of the decisive transitions in early human evolution, was not a single, isolated event. One group, the Lucy species, relinquished the arboreal habitat and became functionally committed, long-distance walkers. For reasons unknown, another group, represented by the Burtele foot, maintained a climbing foot and stayed at least part time in the trees. In hindsight, Dr. Latimer said, “it is apparent which group succeeded.” Homo erectus appears to have been the first to walk on a fully modern foot. The discoverers themselves, as well as other paleoanthropologists, cited the need for more fossils to determine to bodies that went with such a foot and their possible relationship with the much earlier Ardipithecus. New fossil discoveries are not always blessed with immediate consensus. When the 3.5-million-year-old Kenyanthropus platyops was found in Kenya a decade ago, the discoverers reported that it indicated the presence of another species alongside Australopithecus, but that interpretation remains in some doubt. Likewise, a few scientists remain skeptical of the status of Ardipithecus as a hominin; they argue that it was actually an ape that evolved limited bipedalism. Dr. Lieberman seemed to be touched also by an unscientific atavistic influence.